Hitting the zero policy rate threshold has created an unusual problem for the bond markets: they are now the guinea pigs for academic monetary policy experiments. Having become disenchanted with Quantitative Easing, as it in ineffective in stimulating the real economy, policymakers are now gravitating towards Forward Guidance. But as this Bloomberg article notes, people are skeptical about its effects. Mario Draghi’s forward guidance on European Central Bank interest rates has split economists down the middle. Of 31 economists in a Bloomberg monthly survey, 16 said the ECB president’s commitment that official rates would remain at “present or lower levels for an extended period of time” hasn’t been effective. The remainder said it has. It should be noted that economists should be the group most receptive to forward guidance, as they have been indoctrinated with theories about rational expectations during their academic training. If they have doubts about the effectiveness of the policy, it seems unlikely that the policy will have any impact on the broad public, who largely ignored Quantitative Easing. The effectiveness of Forward Guidance would be measured by the ability of Central banks to lower bond yields via the expectations theory of bond yield determination. The problem is that one cannot tie the hands of future policymakers; monetary policy is set by committee. And if the widest output gap since the Great Depression could not stop the monetary hawks from squawking over the past few years, it seems futile to expect that they will be any quieter going forward. The communications problems surrounding Forward Guidance are effectively impossible to surmount. There is only one good reason to buy 10-year bonds at sub-3% yields: the developed economies are structurally incapable of rapidly producing jobs. But policymakers cannot say that, as that would be "talking down the economy". Thus we arrive at policymakers reassuring everybody that the economy is fine, but by the way, buy bonds. As Ben Bernanke noted in his famous speech in 2002, the correct policy decision is to directly peg long-term bond yields, and not fool around with Quantitative Easing or vague jawboning of the market. 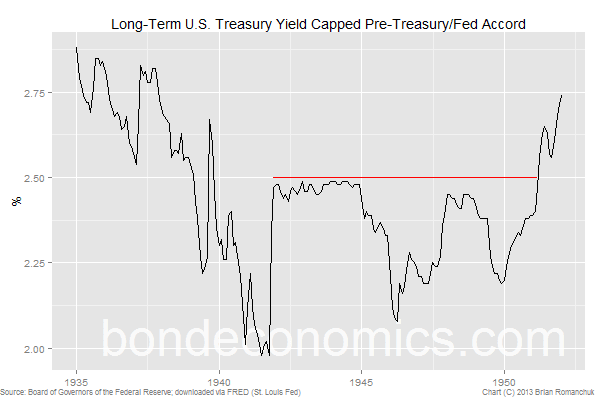 This is not a new policy; the Fed successfully capped long-term Treasury yields by 2.5% for a decade, up until the Fed-Treasury Accord of March 1951. During the 1940’s, this was not a problem. The Federal Government had largely seized control of the economy to wage war against the Axis Powers; anyone foolish enough to speculate against government interest rate policy would probably have been summarily executed as a saboteur. Thankfully, the political environment is no longer conducive to such muscular monetary policy. But as a result, we are stuck with the academic fad du jour, Forward Guidance.